While hubby and I thrill to go pickin’ for antiques in barns, there’s more than a little work involved in dealing with the not-so-nice side of “farm fresh”. “Farm fresh” really is an oxymoron; for the reality is that these items are typically covered in all sort of “ick” — like bird and animal droppings, spider webs, and other things that make the layer (or two) of good old-fashioned dirt seem heavenly. 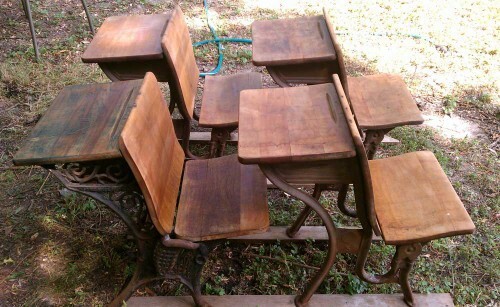 *wink* Since I’ve just spent the past two days restoring some “farm fresh” finds (and rather spectacular ones at that — antique wooden school desk sets! ), I thought it would be a good time to talk about just how to properly clean, care for, and restore antique wooden pieces. It is important to note that when I say “restore”, I don’t mean “refinishing” these pieces. Like most collectors, we prefer to bring pieces back to life — while maintaining the patina and other signs of their former lives. 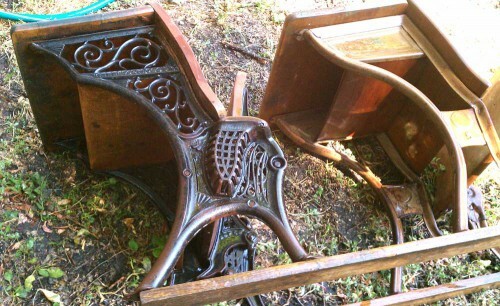 Whether your antique and vintage furniture and other wooden items are covered in “farm fresh” filth or just need a little clean-up, here’s how you can gently take care of them. 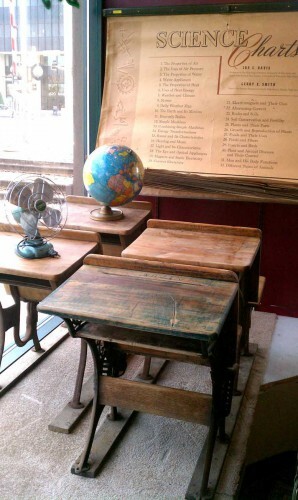 As you can see, these old children’s school desk sets looked like they came out of a barn. To remove the first layer of “crud”, you’ll want to “power wash” with the lawn hose. Stand a few feet away, and let the water spray away the cobwebs, leaves, dirt, clumps of bird poo, etc. Turn the piece over, so that you can get beneath it. This will remove a lot of the surface dirt, as well as stuff that’s hiding in nooks, crannies, and crevices. While the piece is still wet, fill a bucket with warm water, add some Murphy’s Oil Soap, and scrub with a rag. While the manufacturer does not recommend using Murphy’s Oil Soap on unfinished or unsealed wood (and with these old pieces, lots of the original finishes have been stripped or have just plain worn away), we’ve never had any problems. As with anything, test a small area first — especially if you have a painted piece of furniture, or one with decals. At this point, you’ve probably got a bucket full of mud — and furniture that still isn’t clean. So you’ll need another bucket full of clean warm water and Murphy Oil Soap. Only this time, you’ll want to use one of those cleaning sponges with a non-scratching scrubby-side. (For projects like these, we recycle all the sponges which have been spent cleaning around the house.) Use the sponge to scrub off more stubborn dirt, going with the grain of the wood. Once completely dried, we discovered that these desks had been used as tables for painting projects — or at least to hold one of the paint cans, for there was a giant ring of paint and several large splashes of paint too. (Likely lead-based too.) So we had to make a choice and we opted to lightly sand away the offensive paint stains. Then it was one more wash with another bucket of diluted Murphy’s Oil Soap; this time using the soft side of the sponge to go with the wood grain. I think they turned-out quite lovely; even if I do say so myself! 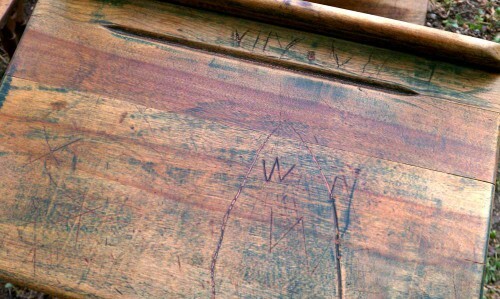 I just love the patina on the one desk with the fancier (older) iron legs — complete with whatever remains of the green stain used and, most charming of all, the old carvings former students had made in the desk top. Now let’s talk about taking care of your antique furniture. Beware the orange oil cleaners, especially for every day use. We can tell you from painful personal experience that those cleaners stripped the finish clear off an antique five-leg table in less than a year. For every day cleaning, use a damp towel with a mild soap — and, with a soft clean cloth, buff dry thoroughly. Wax or oil only when the shine has really left, which is likely once or twice a year. 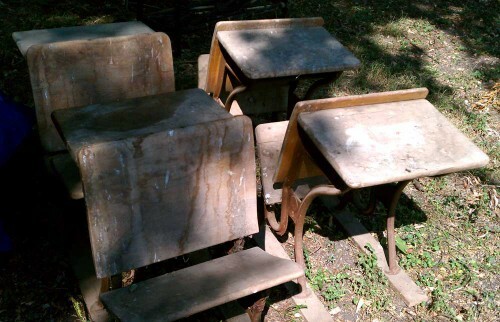 5 Responses to "Antique School Desks: Back To Antiquing Basics (Or How To Clean Antique Furniture)"
Great article – thanks for the tips – what did you use to re-stain (or bring to life) the iron? I have a set of 4 kitchen chairs I had spent a summer stripping and then found out I was pregnant so they have been sitting in a barn/garage for the last two summers~ how do I go about cleaning these so I can finish them? They are full of bird poop but I am afraid to get the chairs wet because they are stripped and bare wood…any advice:(??? Brooke, when items are found like this you have to wash them. Again, I recommend Murphy’s. As long as you let the wood really dry afterwards (if a nice sunny day, outside where the wind & sun can help), washing isn’t bad for bare wood. What damages wood is sitting in water, not drying out. Good luck!